The Best Laptop for Writers doesn’t have to be the best-configured machine on the market. Regardless of your comfort zone, a laptop is becoming an essential device for preserving your work when it comes to writing. On the other side, sharpened displays and more sophisticated peripherals make the laptops targeted towards writers stand out from the rest. If you are looking for a laptop that will put your work in order and replace the scattered papers, this article about the best laptop for writers will help you. Acer Aspire E 15 is a satisfactory budget-ranged laptop, suitable for day to a day use, just like the writing. It is covered in a sturdy plastic, dyed in an obsidian black color, which contributes to a minimalist, yet attractive look. The display and keyboard offer all the comfort a writer is looking for. However, while extremely vivid and color-accurate, the 15.6-inch LED display of E 15 is vulnerable to the sunlight. To get the best of its’ view either keep the brightness near maximum or write in dark areas. That shouldn’t be a problem, given that battery lasts whole eleven hours. The 7th generation Intel processor, i5-7200U performs decently, along with 8 GB of RAM. There is also a solid-state drive of 256GB capacity, to preserve your files and ensure an agile and smooth exchange of files. Gamers will be happy to hear that E 15 supports a moderate level of gaming, thanks to the Nvidia’s 9th generation GeForce GTX 940MX. 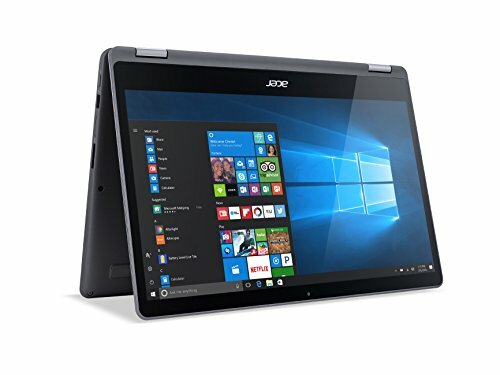 It is more than certain that Acer Aspire E 15 is quite a deal. The dim screen is just a minor issue, which doesn’t give a bitter taste to the writers in the end. The HP Notebook 15 has always been an uncompromised series of laptops. The 15-ay011nr is no exception and it’s perfectly engineered for the users with the lower budget. Nevertheless, the laptop looks far from expensive. The black HP logo in the middle in combination with a beautiful gray color on the lid is a spot on. The laptop is not the lightest machine, but 4.8 lbs are still eligible for traveling. The chiclet-style keyboard looks better than it feels. With the low travel time, it may appear too loud for people who reach high speeds when typing. On the other side, it looks attractive, especially with its’ full size, not lacking the numeric pad. The 15.6-inch display supports full 1080p resolution. It is extremely bright, which helps writer orientate and focus entirely on writing. It feels relatively comfortable to the eyes. The textures are vibrant and colorful, so the laptop is fine for the movies either. HP Notebook 15 i5-6200U and 8GB of DDR3 RAM will be more than enough to use this laptop on multithreading operations. The 1TB of storage is more than sufficient to keep all your drafts in one place. The good news is also, that the laptop lasts almost 6 hours, which is great to use on the go. If you can deal with the slightly uncomfortable keyboard, HP Notebook 15 is a great choice. Asus Zenbook UX330 is compact and portable. Moreover, its’ look is just adorable. The silver aluminum fits great with its’ compact size. Travelers and digital nomads will love the weight of only 2.68 pounds. The 13.3-inch display is vibrant, and even though small, it supports the 1080p resolution. Aside from the great display, ZenBook UX330 sports an elegant and deeply comfortable, and not so convenient touchpad. However, the average speed of 60 to 90 wps will definitely suffice for the vast majority of writers. The ZenBook performs perfectly, just like expected. The Intel Core i5-7200U sports amazing speeds of up to 3.1GHz in its’ Turbo mode. The 8GB DDR3 RAM that comes with it will make maneuvering between a dozen of opened tabs a piece of cake. Additionally, there is an agile 256 GB solid-state drive with outstanding transfer and access speeds. Aside from the beyond-average battery life of 10 hours, Asus invented other features such as fingerprint recognition, and of course, the growing USB Type-C port. It is definitely worth a pick for the professional writers seeking a sub-$1000 treasure. Not many people put hopes in convertible laptops when it comes to writing. But, Acer Aspire R 15 is a machine that will make you change your mind. The laptop can bend 360 degrees, therefore turning into the tablet. The silver shell looks simply amazing. The laptop is not only light but thin too, thereby, a great machine for traveling. The screen is bright, yet glossy. The lack of matte finish makes it reflective, which makes working on it difficult from different angles. Still, it is decently color-accurate, responsive, and wide. The keyboard is very comfortable, thanks to the great travel time and fine spacing. The touchpad as well. As the laptop is convertible, it is understandable that the screen supports finger gestures which are responsive and sufficiently sensitive. The performance is good thanks to the Intel Core i5-6200U and 8GB of RAM. Also, there is a 1TB drive that stores a lot of data. The 8 hours of battery are more than enough to spread your inspiration on paper on the go. If you are looking for a convertible 15-inch laptop, Acer Aspire R 15 is more than satisfying. 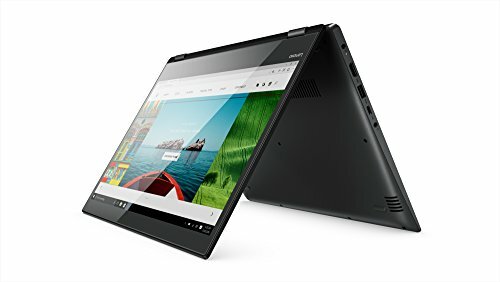 Lenovo Flex 4 is a budget-friendly model of Lenovo’s worldwide popular Yoga machines. This is another convertible laptop, yet with a 14-inch display. The LED-LCD display is decently accurate in either laptop and tablet mode. Unfortunately, despite being a Yoga laptop, it is extremely bulky and heavy for its’ size. One would expect a portable machine from Lenovo. Instead, 3.86 lbs are more than heavy, especially in tablet mode. The laptop sports a decently engineered keyboard. It is eligible for fast typing, reaching enormous speeds while feeling comfortable in the process. The laptop sports a great variety of other features, such as HD webcam, Harman/Kardon speakers which release loud audio with great clarity. The performance is not the best, but will certainly suffice writer’s wants. Intel Pentium Dual-Core 4405U won’t run 10 tabs at once without a lag, but it will accompany you in your writing endeavors. After all, for the tablet, it’s more than enough. The processor has 2.1 GHz capacity and 4GB of DDR4 SDRAM. The good news is that it can be extended to 16 if needed. There’s plenty room for data in a 500 GB storage drive, yet its speed is yet to discuss. Google continues to add amazing features and extensions to the Chromebooks. HP Chromebook 14 is one of the best ones, designed towards writing. It is not a surprise that many writers turn towards Chromebooks after enhanced system, improved displays and keyboards, and more importantly – affordability. 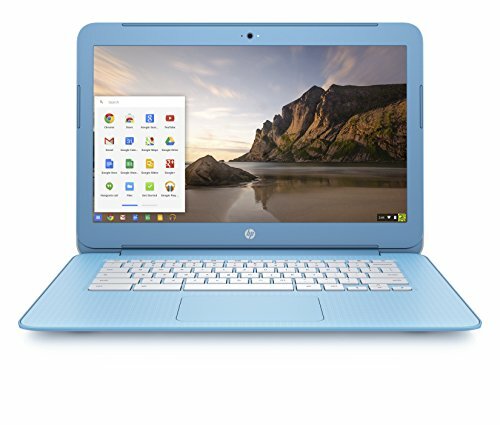 HP Chromebook 14, like its’ name suggests, is a 14-inch laptop with a wonderful blue chassis, to a more modern look. The palm rests are wide and ideal for writers. The laptop weighs 3.40 lbs, which is neither too heavy nor ultra-portable. However, it is a decent catch for traveling, and transporting it in general. The screen is simply wonderful. The clear and detailed textures won’t tire the eye easily and will instead adjust it to the laptop’s environment with ease. Unfortunately, it is a little dim, hence we suggest boosting the brightness as high as possible. The keyboard isn’t perfect, but it has a nice key travel and offers an entry-level convenience for the user. HP Chromebook 14 is equipped with Intel Celeron 2955U and 4GB of DDR3 RAM. There is 16GB Internal storage which is more than enough. The battery life is not perfect, but 6 and half hours are enough to get the work done. 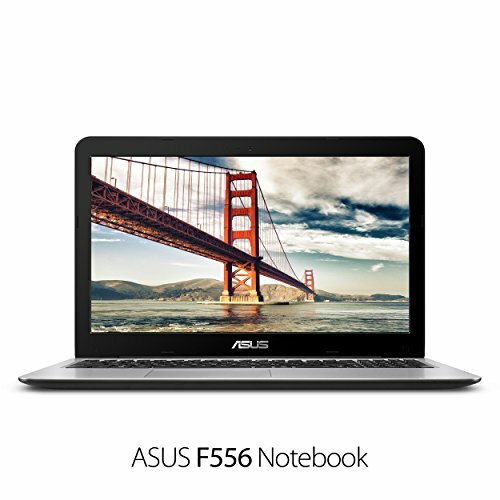 The ASUS F556UA-AB54 is a respectively thin laptop. However, its’ weight isn’t too promising at 5.1 lbs. Still, it can be transported without a sweat. The plastic build is sturdy and it doesn’t compromise the elegant courtesy Asus has, even with the mainstream laptops. The spot on is the keyboard with convenient palm rests. Typing is accurate, fast, and more importantly, convenient. The touchpad is relatively responsive, so you won’t need the mouse. Asus also has to offer a 15.6-inch, 1080p display with vibrant texture and great responsiveness. The laptop is fairly comfortable to use. Sporting a dual-core Intel Core i5 processor and 8GB of RAM, it is a great deal. The processor boasts up to 3.1 GHz in the turbo mode. There is also 256 GB storage for your needs. The solid-state drive works effectively fast, providing the fastest possible protocol even for the bulkiest files. A USB-C port and 7 hours battery are more than we expected from this laptop. The only downfall, is perhaps, that the laptop lacks touch gestures to make it as perfect. Lenovo is having an amazing game and ThinkPad T470 is just another proof. 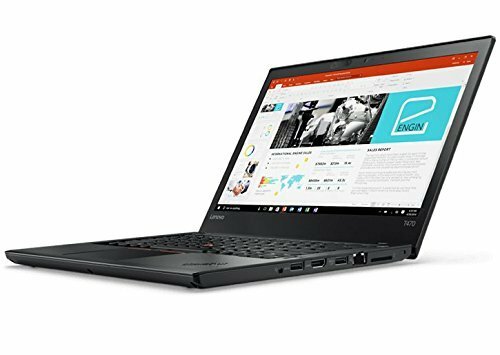 It is a definition of a great variety of features which surpass the competition and make it an ideal business laptop, but nowhere less eligible for the writers too. The raven-black cover, indeed, flatters Lenovo’s minimalist looks. Additionally, the laptop is covered in a convenient material for better use. It weighs 3.40 lbs, making it one of the most portable 14-inch machines currently available on the market. The display is most likely the only disappointing feature of T470. It is dim, lacks brightness in a great matter. Furthermore, its’ color accuracy barely passes the test. The colors aren’t as bright and vivid. It can be a really discouraging trait for writers, given they want their eyes to feel comfortable while they write. On the other side, the pure sophistication is the definition of T470’s keyboard. Its’ comfortable touch left us speechless, while the spacing and key traveling contributed to us reaching great speeds when typing. Typing errors are unlikely. Those writing in hurry will really appreciate it. 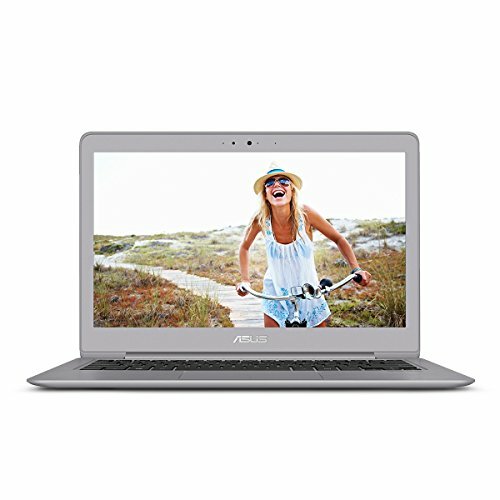 The laptop is equipped with i5-7200U with 3.10 GHz in Turbo mode. The 16GB of RAM will meet all the requirements of the laptop users. Additionally, there is a 256 GB PCIe solid-state drive for fast and smooth storing of data. If you are working a lot, 17 hours of battery life is a superb deal. With small issues such as dim screen and poor sound, Lenovo ThinkPad T470 is a laptop every professional writer should own. For the fans of Apple products, MacBook pro is an uncompromised option for writing. The space-gray textures give the laptop alien-like appearance and more future proofed attitude. 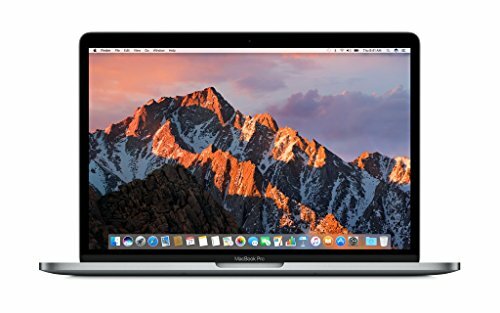 MacBook Pro weighs only 2.5 lbs and is considered ultra-thin. It will effortlessly slip into a bag when you go to work in a library or a café. The Retina display is the definition of convenience and beauty every writer looks after when pursuing the long-term writing. It is not dim, it is sufficiently bright and more vibrant than any other competing display from the list. The 13-inch laptop is perhaps too small to write, yet it is adequate and convenient despite the size. The keyboard is greatly enhanced compared to the last model. It is still far from perfect, though. The butterfly keyboard makes up for the effective and fast typing. However, it makes unpleasant noise while typing. The good side is that it has backlights, allowing you to type in darker areas too. The 2.3 GHz dual-core Core i5 processor with 8GB of RAM is worth the wait. Worth pointing out is also that there is a 512 GB PCIe (Touch Bar edition) drive, which is not only spacious but swift as well. The Intel Iris Plus 640 makes the room for a lower-end gaming too. Overall it is worth having it. The only drawback is the lack of USB type a ports. Dell XPS 13 has every reason to be our winner. The 13.3-inch laptop won our hearts with its’ great compatibility, an advanced QHD+ display, and extra-comfortable keyboard. The chassis is made of brushed aluminum. The additional soft-fiber material makes up for the convenient use. The laptop opens easily and doesn’t have any stutter. The definite feature is the Infinity 13.3-inch display. Dell doesn’t cease to amaze us by fitting such large display into a compact, ultra-thin, and portable laptop. The QHD display is endlessly comfortable. Additionally, when you get tired of writing, you can spend time watching 4K movies on unrealistically high resolutions. The 1.2mm travel time is perfect for the vast majority of writers who are seeking either comfort and speed. The nice spacing on keyboard eliminates every chance of making typing errors. The touchpad is fairly responsive as well, its’ smooth surface is a charm to use. 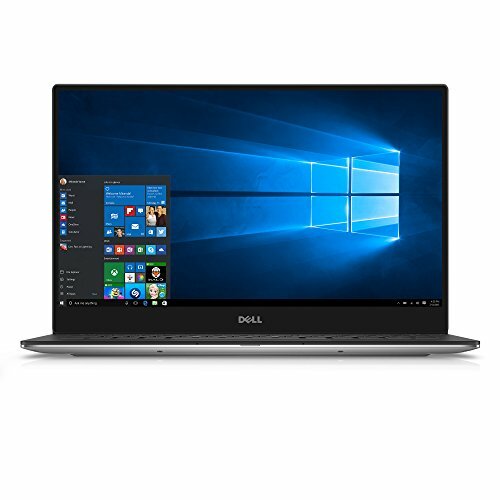 The XPS 13 sports 2.3 GHz i5-6200U processor, together with Intel HD graphics 520, with shared memory. 8GB of RAM is more than enough to keep up with even the most demanding programs and operations. There is also a 256 GB PCIe drive. Dell XPS 13 has everything a writer would ask from a laptop. After all these features, 14 hours battery life doesn’t feel as significant as the QHD display and superb performance. Dell XPS 13 is definitely the Best Laptop for writers. Writers don’t seek top-end configuration to meet their demands. However, it is wise to keep in mind the following features. The display should support sufficient resolution for the user to see clearly. Additionally, it needs to be clear and bright. Dim displays aren’t as bright unless they are set to maximum. The keyboard is the most important feature on the best laptop for writing. Spacious keyboards with fine spacing and sufficient travel time are commonplace among successful writers. If you are typing fast, you should avoid taking onto small and loud keyboards that often lead to typing errors. It is not a secret that good writers seek the inspiration in the most uncommon places. To write in these places, a laptop needs a decent battery life that won’t run out of juice when writers are on the top of their inspirations. More than five hours should suffice. Keep in mind that more feature-demanding laptops result in less affordability. Writing doesn’t require specifications for gamers. However, if you will use your laptop for more purposes, it is recommended to keep an eye on more factors. 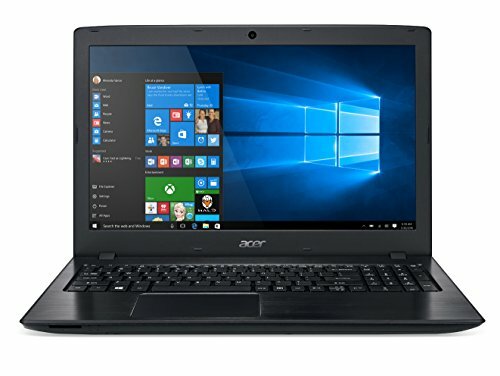 Which laptop do you use for writing and why?